Many older adults deal with the effects of one, two, or several missing teeth. In cases of substantial tooth loss, finding a stable replacement is of the utmost importance. Dentures can help you resume eating, speaking, and smiling with full confidence. Our doctor are pleased to offer full and partial dentures at Dental Center of Jacksonville. Keep reading to find out more about this popular replacement option! A denture is a set of prosthetic teeth placed into a plastic base that is designed to look like gum tissue. They are made of sturdy plastics or acrylic resin. Modern options are highly customizable to match each patient’s unique facial structure. Dentures can be either full or partial, depending on the level of tooth loss. Full denture: Replaces an entire row of teeth in the upper or lower jaw. A full denture is secured in the mouth with natural suction and a denture cream or adhesive, if needed. Partial denture: Takes the place of missing teeth when some natural teeth remain in the gum line. The partial denture is held in place with metal brackets affixed to the natural teeth. Full and partial dentures can be fixed or removable, depending on a number of factors, including your personal preference. Dentures retained by dental implants offer superior stability and promote better oral health. Patients who are candidates for implant dentistry should strongly consider an implant-retained option. It usually takes about a month to receive a traditional denture. We will take impressions of your teeth and put together the specifications for your prosthetic, which is then created in a separate lab. When you return to our office for your new teeth, your trusted dental team will provide you with specific instructions on taking care of a prosthetic. 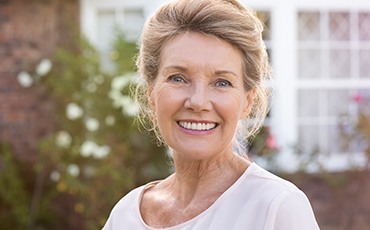 It may take you a little while to get used to your new teeth, but continue to wear the denture as directed and you will speed through the adjustment phase with ease. Keep an eye out for oral sores or signs that your denture isn’t fitting quite right -- namely discomfort and irritation. Don’t hesitate to get in touch with your dentist for a refitting or adjustment whenever you need it! Dentures also provide one of the most affordable options in tooth replacement. While you will need to schedule a consultation with our team to find out the exact cost of your full or partial denture, you can expect to pay anywhere from a few hundred dollars to $1,000 or more. Whatever the price, it’s worth it to enjoy all the benefits of a full, complete smile. We can also help you make dentures more affordable with options like the Dental Savers Plan available exclusively at Dental Center of Jacksonville. For one low annual fee, you can receive free checkups and cleanings as well as additional discounts on restorative treatments including full and partial dentures. Our office also works with dental insurance, and most plans will cover a significant portion of the cost of dentures (unlike dental implants, which are still often not covered by dental insurance). If you are in need of high quality dentures but aren’t sure if you can fit them into your budget, please do not hesitate to get in touch with our office to discuss how we can help you make tooth replacement more affordable. We know that tooth loss itself can be upsetting, painful, and even frightening, and the last thing we want is for the restoration process to be just as stressful. One way the Dental Center of Jacksonville team goes above and beyond to create the best possible patient experience is by taking the time to answer all of your questions and carefully explain your treatment plan. When it comes to restorations like partial and full dentures following advanced tooth loss, we know our patients have questions, and we’re here to help. Please don’t hesitate to contact us between visits or ask during your appointment if a question arises. 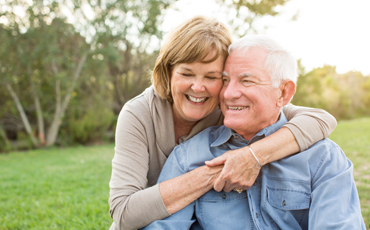 Below, you’ll find the answers to many of our frequently asked questions about dentures. How Much do Dentures Cost? The cost of your denture will depend in large part on your unique situation. Partial dentures may cost between $500 and $2500 or higher in some cases where innovative materials or techniques are used. Full dentures typically run between $700 and $5000. If you decide to receive a dental implant supported denture, this cost is in addition to the price of the dental implants, their surgical placement, and the denture attachment process. It’s important to remember that the cost of your partial or full denture will likely be greatly reduced by dental insurance coverage, so your out of pocket payment may be 50% of this cost or lower for patients with the best insurance plans. We will review your unique insurance policy and provide a specific cost estimate during your tooth replacement consultation visit. Dentures can last for five to seven years, sometimes longer, without the need for repair or replacement. Dental implant supported dentures last much longer, and some patients are able to maintain an implant supported denture for the rest of their lives. What Holds Dentures in Place? Partial dentures are clasped into place attached to surrounding teeth. 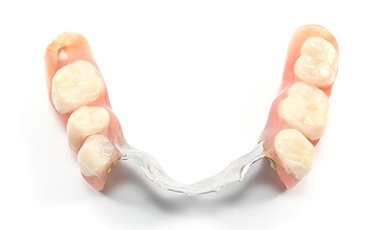 Full dentures are formed to fit snuggly against the gums. This creates suction that holds the prosthetic in place. Some patients also use a small amount of denture adhesive to improve the stability of their denture. For the most natural feeling dentures, dental implant supported restorations are the ideal option. They almost completely recreate healthy tooth function. How do I Take Care of my Denture? Taking care of dentures is fairly straightforward. You’ll need to remove them each night before bed. You should brush your prosthetic using a specialized denture toothbrush or an ultra soft bristled traditional toothbrush. To make sure you don’t unintentionally damage the denture during cleaning, place a towel on your counter or partially fill the sink with water to provide a cushion. Once your dentures are cleaned, you should also gently brush your gums, tongue, and palate to remove any buildup of plaque or tartar. If you have remaining healthy teeth, you should also continue to brush and floss these teeth as usual. 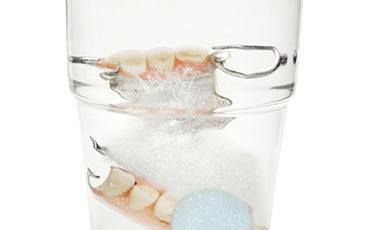 Overnight, you should store the denture in water or cleansing solution. In the morning, thoroughly rinse your denture, brush gums, and brush and floss remaining teeth as necessary. Following meals, you may also want to take a few moments to rinse your dentures with cool water. Never use warm water as this can warp the supportive base material, leading to the need for repair or replacement more quickly. Can I Keep my Healthy Teeth? Absolutely. If you have healthy remaining teeth, we want to preserve them. For patients who do have healthy teeth, we’ll create a partial denture. These dentures fit snuggly between remaining teeth recreating the natural smile line and leaving you with healthy, natural function. Partial dentures are held in place by clasps attached to remaining teeth or they can be supported by dental implants. We offer both forms of partial for your convenience. Are you searching for a high quality tooth replacement? Please don’t hesitate to get in touch with Dental Center of Jacksonville. Full and partial dentures provide a wonderful solution for many patients. Go ahead and request an appointment today! Fill out this short form and we will get back to you with the answers you need.